The FAR of a typical OB Lot explained. 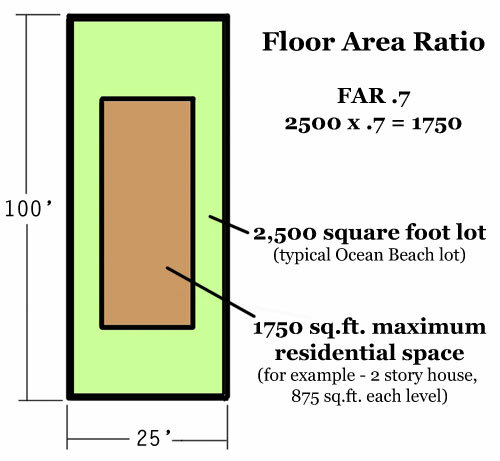 At its meeting on October 21, 2015, the Ocean Beach Planning Board adopted a policy on acceptable deviations to floor area ratio (FAR) under City-mandated incentive programs for sustainable development. The Ocean Beach Planning Board recognizes the value of sustainable development in the urban environment. We support the City of San Diego Climate Action Plan goal of achieving 100% renewable energy by 2035. In addition, the Ocean Beach Planning Board recognizes California’s Long Term Energy Efficiency Strategic Plan to make all new residential construction Zero Net Energy by 2020, and all new commercial construction Zero Net Energy by 2030. This element is also noted in Section CE-A.5 of the City of San Diego General Plan. Discretionary projects must provide 100% of their projected total energy use utilizing renewable energy resources to demonstrate Zero Net Energy. Provide a building energy model and signed calculations from a licensed engineer demonstrating the project will be Zero Net Energy via on-site renewable energy generation. Sustainability is a critical part of the mission to preserve the health and vitality of Ocean Beach, and the community is willing to compromise the most sacred tenet of our land use policy—the FAR— for projects that demonstrate the highest performance criteria for green building. A deviation of up to a maximum of 10% of the allowable FAR would be granted if the Ocean Beach Planning Board finds that the project aligns with these Green Building criteria, provided that the project does not encroach into allowable setbacks or is otherwise inconsistent with the Community Plan. City Council Policy 900-14 is a dated document established in 2003. The Ocean Beach Planning Board recognizes that updates are needed as building codes become more stringent in order to align policy with implementation procedures in developing a more sustainable future. This was an official statement from the OB Planning Board. OB’s FAR is what we have used for nearly 4 decades to manage over-development. I’m glad the OB Planning committee has set the bar very, very high for anyone who wants to go for a modification or deviation to the 0.70 floor area ratio. The OB Community Plan goes before the San Diego City Council on Nov. 9th at 2pm; can you editordude, help get the word out? Old Hippie – we’re on it. See tomorrow (Tuesday) posts. My concern about FAR variences for LEED Platinum building practices is the future gentrification of OB. LEED Platinum has outrageously expensive requirements. So what we’re telling people is that it’s ok to build a new house (with the teardown of a quaint cottage coming first) or do a major rebuild AND you can build bigger than all of your neighbors if you spend more money on your house to appease the environmetal regulatory gods? So over time, OB will become more 1% elitist because the cottages will slowly be converted to larger, more expensive, out of place, yet “environmentally friendly” houses that few can afford. Beware of the false value of LEED standards!. An energy efficient and sustainable home can be built without all of the government approved, high tech, high cost “LEED you around by the nose” requirements. And they can be built without the FAR give aways that will change OB forever. The planning board just sold out our neighborhood to environmental elitists! Older Article: Why Is Navy Waste Water Carving Valleys in Point Loma?